When I meet students online for office hours, it’s vitally important that we have an shared online whiteboard to use as a space to do problems. These online whiteboard tools tend to come and go, so don’t shoot the messenger when one of the tools in the list below disappears. The good news is that these types of tools seem to pop up on the Internet all the time, so where one disappears, three others take its place. 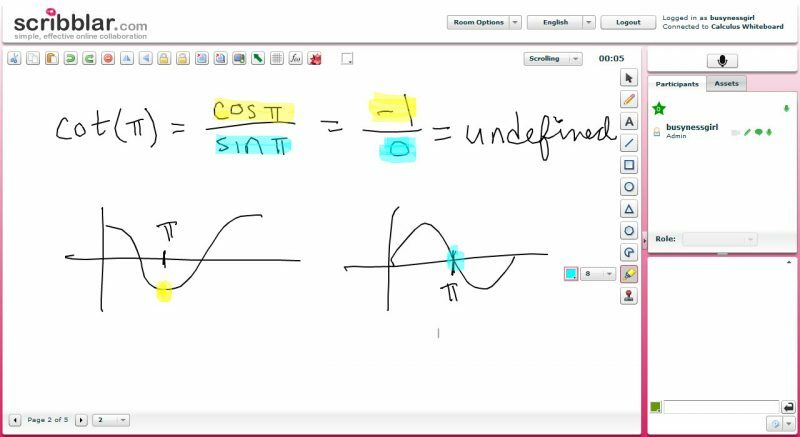 I’ve been on a search for my “perfect” online whiteboard this week, so I thought I would run through several of the available options, and do my “math teacher analysis” for each. I use the Chat interface in Canvas to see and hear my students, so I’m really only concerned with finding the “perfect” drawing space. I paste the URL for the whiteboard in the text chat window, and we can all view the drawing screen from that link. For the record, none of these tools will work on an iPad. They all run using Flash and/or Java plugins. The native Canvas Chat is actually Tinychat, and there is a whiteboard plugin included. However, it’s Flockdraw, and of all the tools I tested this morning, it is in the bottom two in terms of performance (toss up between Flockdraw and Google Draw for worst tool). 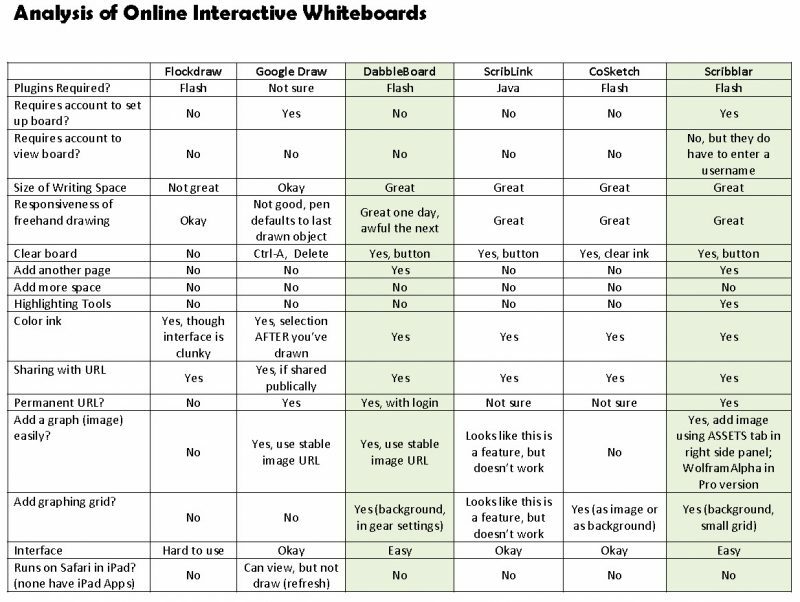 Here’s my detailed analysis of the six online whiteboard tools. In the “War of the Online Whiteboards” I was torn between Dabbleboard and Scribblar. I listed Dabbleboard as my top choice on Wednesday, but then its performance on Thursday was so horrid I’ve reversed my decision. 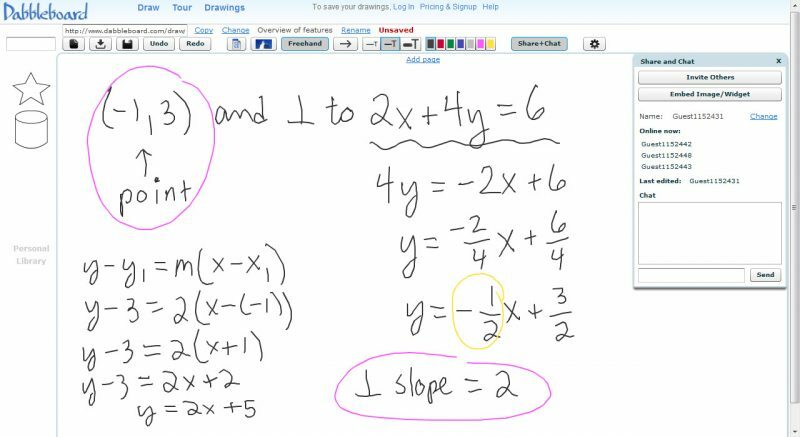 Scribblar has a couple of advantages: highlighter pens (the only tool I looked at that included this option for drawing) and if you do splurge for a Pro account there is a built-in WolframAlpha button which pastes the output of a WolframAlpha search directly to your screen. The only downside of Scribblar is that students are prompted to “login” when they follow the URL to the whiteboard. They don’t really have to login, they just have to provide a username for the board, but you will probably have to explain this to every single student that follows the link (sigh). 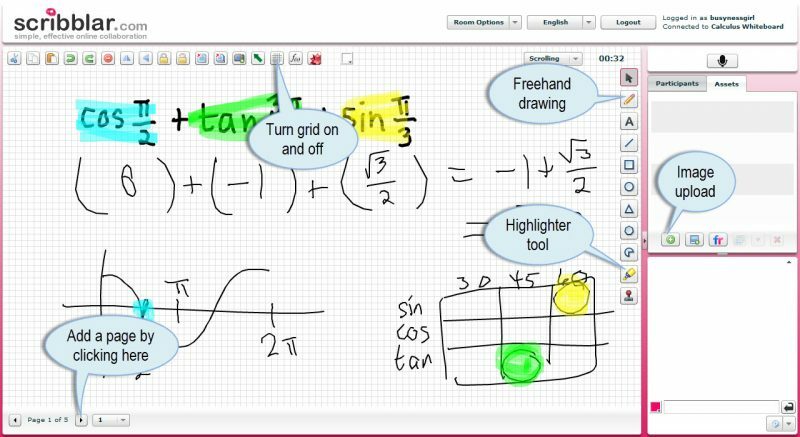 My recommendation for math teachers using the Instructure Canvas Chat: Ditch the Flockdraw whiteboard and create a “permanent space” in Scribblar or Dabbleboard (both will require you to create a free account for a permanent room) where you can keep a collection of all the pages you’ve used for a given class. Create a different space for each class. Then paste (or re-paste) the URL to the room URL into the text chat whenever a new student arrives in Canvas Chat (since they don’t see the past history of the chat).